Effective techniques for human detection are of special interest in computer vision since many applications involve people’s locations and movements. Thus, significant research has been devoted to detecting, locating and tracking people in images and videos. Over the last few years the problem of detecting humans in single images has received considerable interest. Variations in illumination, shadows, and pose, as well as frequent inter- and intra-person occlusion render this a challenging task. Pedestrian detection is a well-known problem in Computer Vision, mostly because of its direct applications in surveillance, transit safety and robotics. In the past decade, several efforts have been performed to improve the detection in terms of accuracy, speed and feature enhancement. In this work, we propose and analyze techniques focusing on these points. First, we develop an accurate oblique random forest (oRF) associated with Partial Least Squares (PLS). The method utilizes the PLS to find a decision surface, at each node of a decision tree, that better splits the samples presented to it, based on some purity criterion. To measure the advantages provided by PLS on the oRF, we compare the proposed method with the oRF based on SVM. Second, we evaluate and compare filtering approaches to reduce the search space and keep only potential regions of interest to be presented to detectors, speeding up the detection process. Experimental results demonstrate that the evaluated filters are able to discard a large number of detection windows without compromising the accuracy. Finally, we propose a novel approach to extract powerful features regarding the scene. The method combines results of distinct pedestrian detectors by reinforcing the human hypothesis, whereas suppressing a significant number of false positives due to the lack of spatial consensus when multiple detectors are considered. Our proposed approach, referred to as Spatial Consensus (SC), outperforms all previously published state-of-the-art pedestrian detection methods. The large number of surveillance cameras available nowadays in strategic points of major cities provides a safe environment. However, the huge amount of data provided by the cameras prevents its manual processing, requiring the application of automated methods. 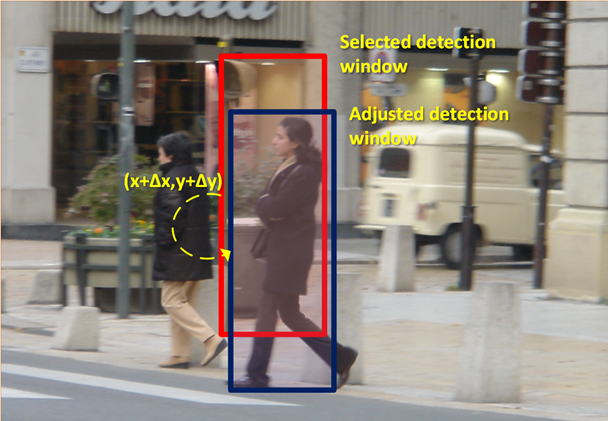 Among such methods, pedestrian detection plays an important role in reducing the amount of data by locating only the regions of interest for further processing regarding activities being performed by agents in the scene. However, the currently available methods are unable to process such large amount of data in real time. Therefore, there is a need for the development of optimization techniques. Towards accomplishing the goal of reducing costs for pedestrian detection, we propose in this work two optimization approaches. The first approach consists of a cascade of rejection based on Partial Least Squares (PLS) combined with the propagation of latent variables through the stages. Our results show that the method reduces the computational cost by increasing the number of rejected background samples in earlier stages of the cascade. Our second approach proposes a novel optimization that performs a random filtering in the image to select a small number of detection windows, allowing a reduction in the computational cost. Our results show that accurate results can be achieved even when a large number of detection windows are discarded.